LONDON — Manchester City's quest for a quadruple is still on, thanks to a bit of luck and some help from the referee, but Manchester United has only one remaining chance for silverware after being dumped out of the FA Cup by Wolverhampton Wanderers. On a contrasting Saturday for the two rivals, City came from two goals down to defeat second-tier Swansea 3-2 in the quarterfinals while United went down 2-1 at Wolves. 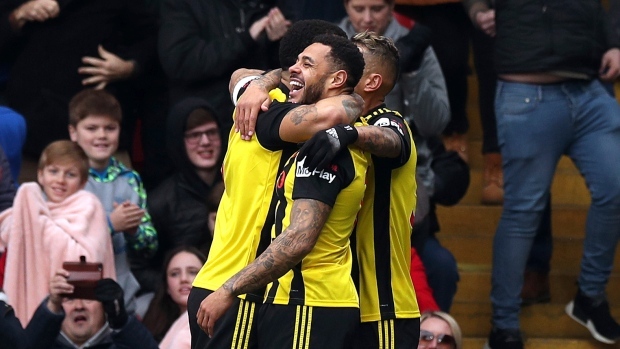 Watford also reached the semis after substitute Andre Gray scored two minutes after coming off the bench to secure a 2-1 victory over Crystal Palace. City was incorrectly awarded a penalty that led to the equalizer before Sergio Aguero scored the winner from an offside position to end Swansea's hopes of pulling off a massive upset. It all kept coach Pep Guardiola on track for a possible four titles. City has already won the League Cup, leads the way in the Premier League and is into the Champions League quarterfinals. United had knocked out Arsenal and Chelsea in the previous two rounds, but manager Ole Gunnar Solskjaer now has only the Champions League left as a trophy target, although his team has to get past Barcelona in the last eight. City almost saw its FA Cup campaign ended by a Championship side for the second straight season, having lost to Wigan in the fifth round last year. It was a goal that had all the hallmarks of City's slick attacking play, which was missing from the visitors for most of the match. City continued to pressure Swansea and the penalty came when Cameron Carter-Vickers was adjudged to have fouled Raheem Sterling in the box, even though replays clearly showed he got the ball. The Argentina striker then headed the winner in the 88th. However, replays showed he was offside when the cross was delivered, highlighting the absence of video reviews for the game. VAR was only in use at Premier League stadiums in the quarterfinals. Swansea manager Graham Potter refused to blame the referee. "City had chances of course, you can't deny if you look at the game that they deserved to win," Potter said. "But for the players, it's disappointing to lose goals in that manner. That's life, referees make mistakes as well." Wolves reached the semis for the first time since 1998 after Raul Jimenez and Diego Jota scored in a six-minute span in the second half. Jimenez swiveled in the box and fired a shot that went past two defenders and goalkeeper Sergio Romero, who had made a string of saves to keep United in the game. Jota then finished off a lightning counter attack to double the lead, which never looked under threat until Marcus Rashford pulled back a consolation goal deep into injury time. "We started too slowly and played into their hands. Our possession wasn't bright enough and quick enough," Solskjaer said. "This was a big step backwards, mainly because of the quality of the possession and the passing." In the early game, Gray latched on to Roberto Pereyra's chip into the area and volleyed in left-footed in the 79th minute as Watford became the first team to book a place in the last four. In the last quarterfinal, Millwall hosts Brighton on Sunday. Last-place Huddersfield was 3-1 up after Karlan Grant scored his second goal of the game in the 65th minute and looked headed for only a second win since November. But after Angelo Ogbonna pulled one back for West Ham, substitute Javier Hernandez scored two late goals to complete the comeback. It leaves Huddersfield staring at near-certain relegation as the team remained 16 points from safety with seven games left. Burnley had a great chance to move five points clear of the drop zone but couldn't take advantage of Leicester defender Harry Maguire's sending-off after four minutes.